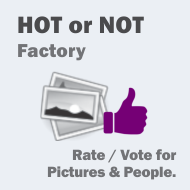 Hot or not Factory is an image voting and rating system for Joomla. Users can upload pictures that others can rate and vote for with just one click. Best voted media can be seen in a listing or in a module. Users can comment on their media or on other users' media. The component can be used to rate different images like landscapes, art, etc. or if the gender mode is enabled, it will enable categories for male and female images. The upload is very easy, allowing also multiple uploads. For each picture a sharelink and the number of hits will be visible and if admin enabled the description, comments and tags. To allow the administrator content control on the site, each picture and comment can be reported. Picture Voting with 5 or 10 stars. Enable/disable voting for guests (unlogged users). Enable/disable upload images for guests (unlogged users). Set 1-10 or 1-5 voting scale. Set upload folder, Resize height and width, Thumbnail size, number of uploaded images at once. Enable/disable image description, Description length, Enable/disable require description on upload. Enable/disable tags, Maximum allowed nr. of tags, Enable/disable require tags on upload. Display number of images per page, Display last x comments per page (0 for all). Enable/disable gender mode (male / female). The component comes also with several FREE modules - click for more details!